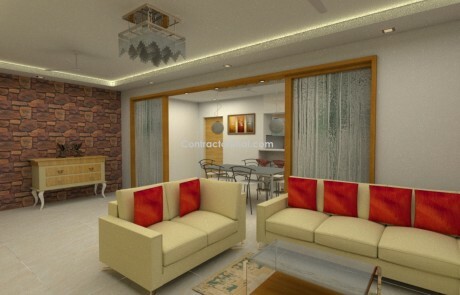 Here is one of the 3-D design service project that we completed for Mr. Patel’s 3-BHK apartment in Ankleshwar town, Gujarat. Ankleshwar is a very active Industrial zone in Bharuch district,Gujarat. This town is known for its industrial township called GIDC (Gujarat Industrial Development Corporation). Ankleshwar has an office of the ONGC (Oil and Natural Gas Corporation Limited). Ankleshwar has over 1500 chemical plants, producing products such as pesticides, pharmaceuticals, chemicals, and paints. Coming back to the project, following is our stepwise process to 3D design project. While my first visit on site i.e. the apartment, there were some final finishing work going on. (you can see the picture of the same in the video. )The apartment had a huge Living room with open kitchen that was connected to living room. 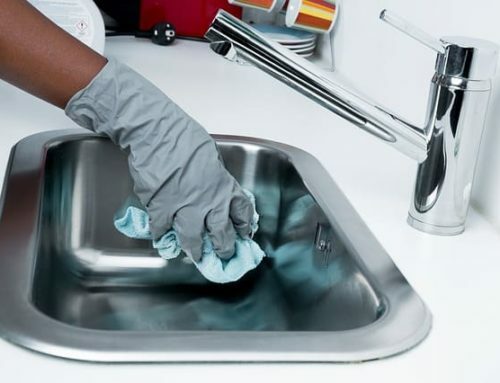 During our first visit, we usually note down clients’ requirement, site measurements of each room and other details like clients likes, dislikes, etc. 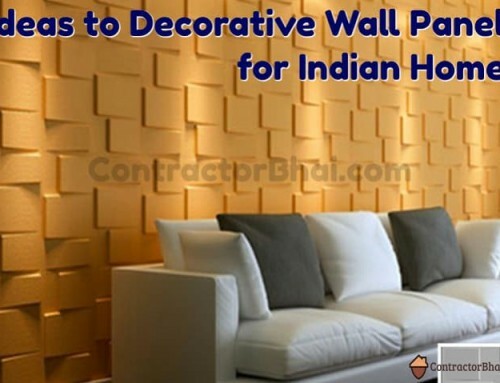 To do the interiors of the house right from furniture to wall painting to lights and its fixtures to kitchen cabinets, storage, etc. 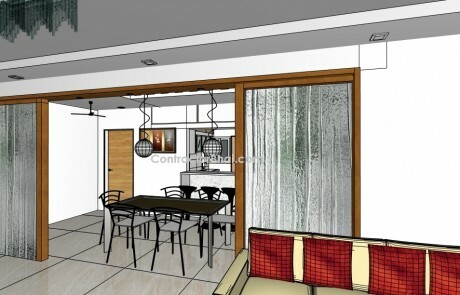 Most importantly, client wanted to have open kitchen with dining area in living room. As per client’s requirement and our expert suggestions, we made rough sketches for each room through or 3D design software. Well until 3D design service came in, all the discussion’s and plan were done verbally. 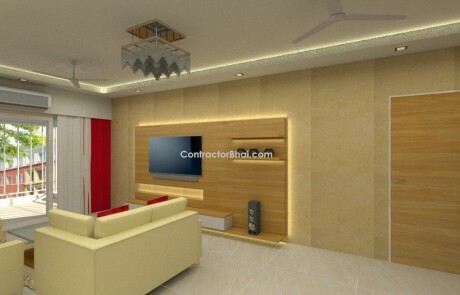 It was difficult for a home owner to visualize how his apartment will look after all interior work is done. But now with 3D design service, our clients can actually visualize how their apartments will turn out to be after doing all required interior work is completed.The major advantage of rough sketch here is that all the ideas are on papers that are much refined. The client, i.e. 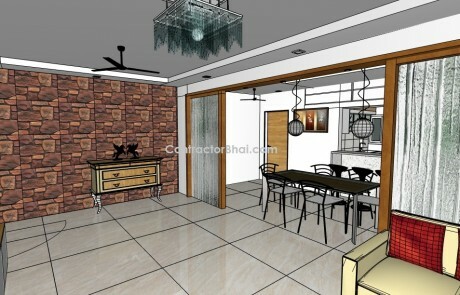 Mr. Patel was able to actually visualize how his kitchen, living room and other rooms will appear like. It made easier for him to ask for changes like we wanted to able to view Television that is in Living room, while in kitchen. 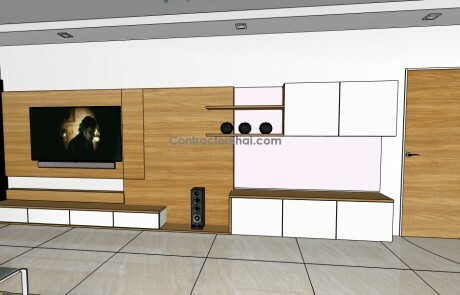 We therefore made necessary changes and also shifted the TV unit accordingly. Another major advantage of rough sketch is that the client can make changes as per his choice even before the actual work has started. 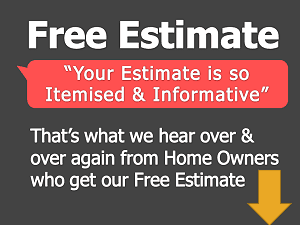 This make home owners and contractor’s work easy and faster too. Imagine if all the work about finalization and then home owners would ask for changes. It would be hell of work for contractor which would consume time and money too. 3D photo realistic sketch – Once the rough sketches are approved and finalized, a 3D photo realistic sketch was worked on. These 3D designs are not reference pictures or images. These are sketches where in the chosen material for a product or feature is shown. • The actual color and shade of wall paint. If the color is glossy it will glow and if matt, how will it look. 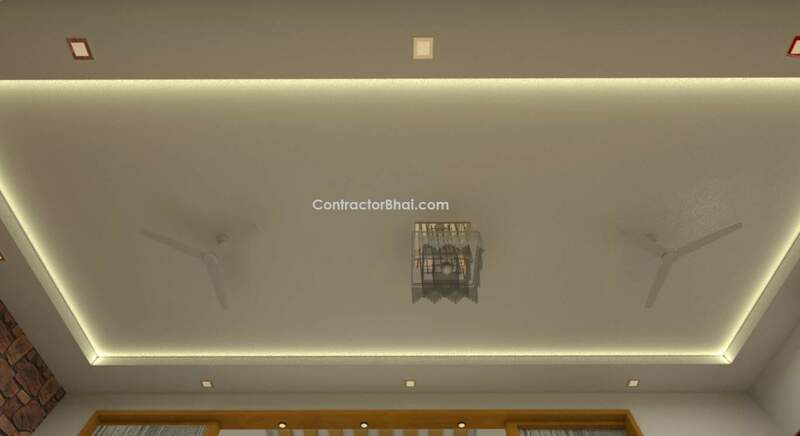 • Type of False ceiling and its shape and its impact in the room. 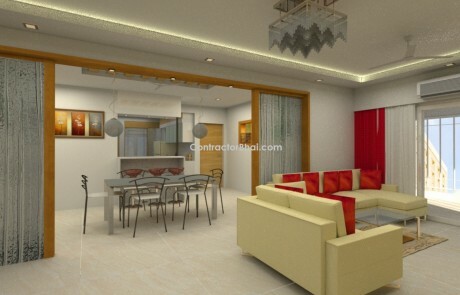 • Type of light and light fixtures used to enhance and create and ambience for house interiors. Etc. Etc. as you see, with photo realistic sketch, a home owner can get closet to how his apartment will appear in reality with all interior fixtures and products. Very important – All the drawings be it rough or final, 2D or 3D, all are made as per actual site measurement. Here each and every thing, be it a small-thin beam, short angle, walls, flooring, loft,etc. is measured is detail like its height, width, length and depth. All the measurements are noted in “mm” i.e. millimeter. 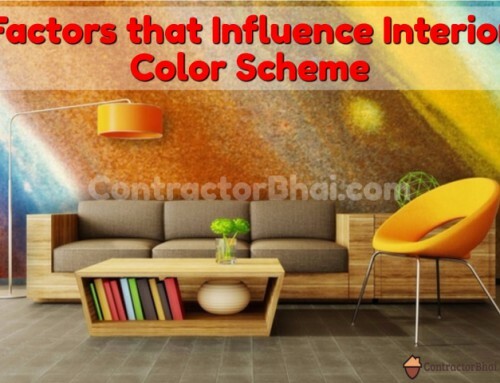 These measurements are shared with the appointed contractor too. After all 3D drawings and approvals, we finally work on 2D elevation drawings of each wall or segment of the house. Elevation mean the front view of the wall. In 2D elevation drawings, the client gets to see each and every object be it the smallest one of each wall. You can see the TV wall elevation in the video, followed by wall where seating arrangement is placed and other walls too. As I said earlier, the 2D drawing are shared with contractor too for their reference. These 2D drawing help them work faster and better since it has all the details like detailed size (height width and depth), what is to be placed where and how far and above from floor level, what material is to be used, etc. 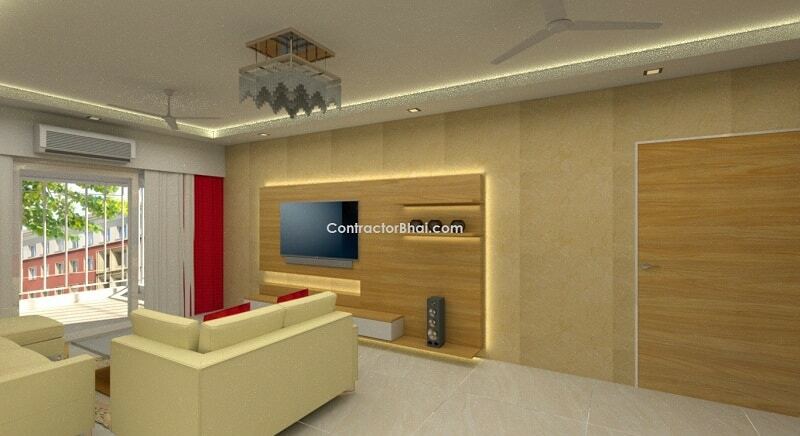 All the details required to work for a contractor or even a carpenter, everything is mentioned. 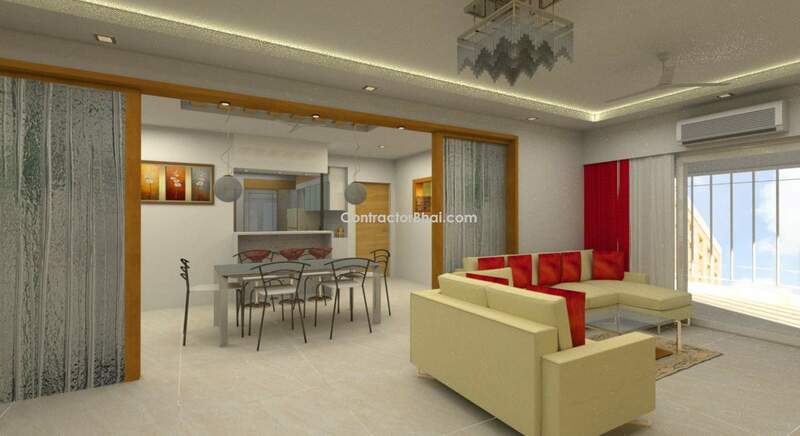 Since all the details are given to him, a contractor is able to work faster and also able to focus on quality too. 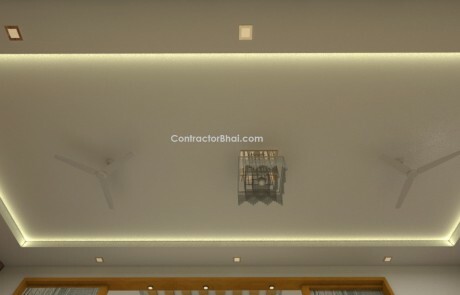 Mr. Patel was very glad with 3D design service offered by Contractorbhai.com and our way of working and last but not the least the final Interior work done too. He was so delighted that he referred us to many other friends. 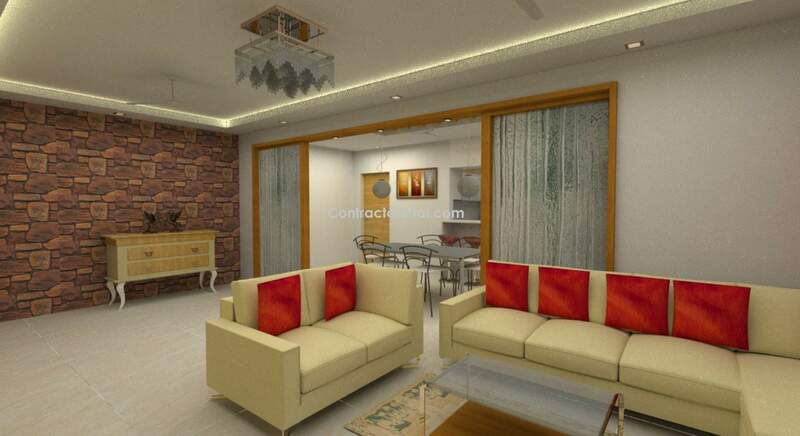 By now we have completed multiple homes of his friends in Ankleshwar itself and Ahmedabad too.